Quarantining fish before adding them to the main aquarium or when they’re sick is a very important part of fishkeeping, but it’s often overlooked even by more experienced aquarists because they think it’s too expensive to buy another tank or because they simply can’t wait to put the new fish in the aquarium. In the previous article, What is a quarantine tank?, you can read more about what a quarantine tank/tub is and why you should really have one ready at all times – in this article, I’ll be answering some questions about the easiest and cheapest ways to set up a good quarantine tank and which equipment you’re going to need. What can you use as a quarantine tank? May long-time fishkeepers usually have a spare tank lying around that can be used to quarantine fish. If you don’t, a food-safe Sterilite tub works perfectly for quarantining as well and is much cheaper than an actual glass tank. How big it should be depends on the fish that’s going to be in it – for a betta or groups of small schooling fish, a 4.5 gal (17L) is fine. For bigger fish that produce a lot of waste, like goldfish or angelfish, go for something bigger like this 17.5 gal (66L) so you don’t have to change crazy amounts of water every day! It is also a good idea to always have the more basic types of fish medication and aquarium salt on hand. That way you don’t have to run out to the store if the fish does turn out to be sick! Look for this sign to check whether a tub is food- and thus aquarium safe! How do you set up and maintain a quarantine tank? If you are setting up a quarantine tank to temporarily quarantine a new addition to your aquarium (to make sure no diseases are present) and don’t plan on using medication that damages your beneficial filter bacteria such as antibiotics, it’s a good idea to use cycled filter material in the filter. That way the quarantine tank is instantly cycled and you don’t have to do water changes every day. If you’re not sure how the cycle in an aquarium works, have a look at this article for more information. If you’re setting up a quarantine tank because you have a sick fish and need to use harsh medication or salt, using cycled filter material is pretty much pointless because the beneficial bacteria will soon die off, ending the cycle. You can use fresh filter material and will unfortunately have to do a lot of water changes. To set up your quarantine tank/tub, just place it on a flat surface like a table, desk or on the floor, preferably in a room where it’s relatively quiet. Fill it up with half conditioned water and half water from the tank the fish is currently in (to lessen stress) and place the heater, filter/air pump and hiding places in it. 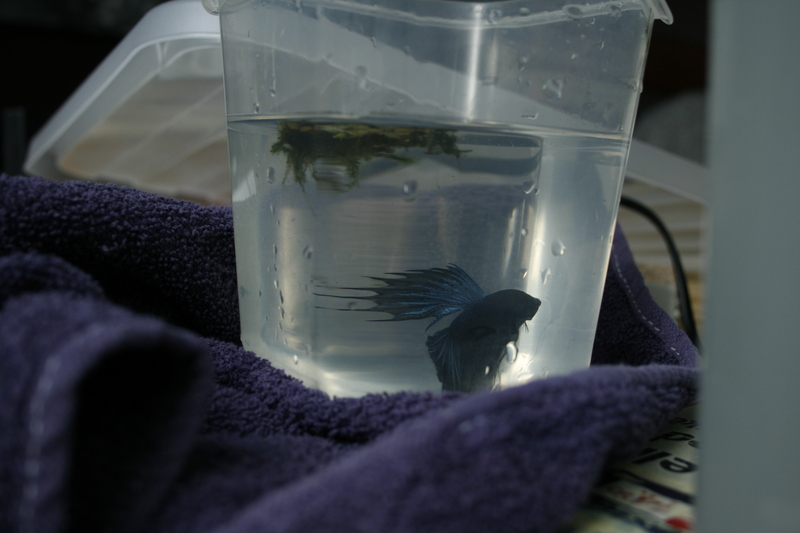 Add the correct dose of medicine or aquarium salt if necessary – be sure to pre-dissolve salt in a different container. As soon as the heater has done its work (the water in the quarantine tank should be the same temperature as the water the fish is currently in), you can start acclimating the fish. Don’t just throw it in there! It needs some time to adjust to 50% tap water and possibly medication/salt. Waiting for the water change to be done. How often a water change should be done depends on how heavily the quarantine tank is stocked and whether the filter is cycled or not. If the filter is cycled, full water changes aren’t necessary and you can just do partial water changes regularly based on the stocking level. If your quarantine tank is uncycled, it’s a different story and you’ll have to do 100% water changes to prevent ammonia buildup. To do this, you can carefully guide the fish into a smaller container. Put the lid on and put it in a safe place (preferably somewhere slightly darker) where no one can bump into it while you empty and refill the quarantine tank with water of the same temperature and, if necessary, redose the medication or salt. Then you can float the smaller container in the big tank/tub while acclimating the fish and release it after 10-15 minutes. If you think there is something missing in this article, if you need more info on quarantine tanks/tubs or if you just want to share your experiences, feel free to leave a comment below. Happy fishkeeping! Hi! Half a gallon is a little small in my opinion, I would be a little worried about water quality. A food-safe tub is fine as a quarantine tank if you have the chance to buy any of those (or even have one lying around). By the way, since you can’t really keep anything but a Betta in a 5 gal I assume it’s going to be the only inhabitant – if that’s the case you can also just opt to place it right into the main tank without quarantining. If it’s carrying any contagious diseases there is nothing it can pass them on to anyway, and if it turns out you do have to use medication that damages the main tank’s filter bacteria you can always set up the quarantine tank. Hi, I was hoping you could help me out. My betta fish has fin rot and I’ve read up about it and my tank i have him in is a 15 litre ( 3 gallons ). I wanted to have my quarantine tank small enough to float in the main tank so i don’t need to buy another heater ( i live in a colder climate so i would definitely need a heater ). but what you’re telling me is that i need a 7 gallon tub??? Also, i plan on using aquarium salt and the article before that i was reading said it needed to be 100% clean water. How would i acclimate him to that? thank you so much please respond quickly, I’m really struggling. The 7 gallon tub thing is just so I could link to an example, you can also use something else. I’m not a fan of keeping Bettas in tanks under 5 gallons, so I usually recommend anything between 5-10 gallons. I guess you could use something that floats in the main tank, though, although you have to keep in mind that the water quality might deteriorate very quickly in such a small container. A nice sized food-safe container should also work. Also, on an important note, aquarium salt doesn’t do anything for fin rot! If super clean water (extra water changes, etc.) isn’t helping you unfortunately have to go for medication. I’ve got a full article on fin rot here. I hope that helps a little! Hope your Betta recovers. I think I understand how and when to use a QT with an established tank (although I would like to know what I’m supposed to be looking for with the QT’d plants other than snails?). 1) When can plants go in? Assuming this is the only tank I’ve got and the plants are coming from a store. 2) After the tank has cycled and the values look good – I’m ready to add a fish, but would there be any reason to QT this new fish before adding to new(but cycled) tank? With plants it’s basically snails and maybe damselfly larvae, although I don’t think those are very common. Sme parasites like ick might also hitch a ride on plants though it probably won’t be very common. When you’re setting up the tank the plants can go in right away. If you’re setting up a “main” tank for just one fish (such as a Betta fish) then quarantining isn’t really necessary – if the fish turns out to be sick you can just treat in the main tank, as no tankmates will unnecessarily be affected by the medication. But if I don’t cycle the water, the nitrite level is very high like over 5.0 ppm. Is that safe for my betta? If you’re just quarantining a fish you can cycle the tank, but keep in mind that if it turns out you have to use medication, the cycle can quickly be destroyed. I am doing this for my daughter’s betta. I think the poor thing got fin rot. I don’t want to kill her fish. So I just want to make sure that it is ok to use conditioned tap water with no ammonia, no nitrate but high nitrite as long as I change the water everyday? And it is ok to use the old water in the hospital tank? It won’t spread the disease? I really don’t want the fish to die sooner because I try to treat it. Thanks. Okay, thanks for the extra info! I misunderstood a little there, I didn’t realize your tap water itself had high nitrites. That’s definitely difficult, as 5.0 ppm is much too high to be safe. If the fin rot is just starting, you don’t have to move the fish to a hospital tank. If the current setup is suitable (5+ gal, heated, filtered & cycled), you can just keep the fish in there and keep the water VERY clean. If it’s already pretty bad or keeps progressing, you’re faced with a bit of a problem: you have to use antibiotics, which can crash your cycle. That means the fish has to be moved to a hospital tank to protect the main tank, but in the uncycled hospital tank you have to do daily water changes and the nitrites will be too high. I hope that makes sense! It’s very difficult to determine what’s best (or least bad) for the fish in this situation. What I would do if a quarantine tank is really required: cycle it, then treat with antibiotics and HOPE the cycle doesn’t crash (too badly). Do daily water tests to monitor it. If you can avoid using a quarantine tank, that’s definitely preferred in this case. I’m really sorry I can’t give you a clear answer, all of the options pose a risk to the fish unfortunately. If you need more information about treating fin rot, be sure to have a look at this article. Best of luck and I hope the fish is okay. Thank you. This sure clear lots of thing for me. I think will try the fish less cycle in my spare 10 gallon tank and use that water in the 1.5 gallon tank. That should give me enough water to do water change for a few days. Hope this works. Never done a fish less cycle before. Thank you. can i use a fish bowl as a quaratine tank its medium in size ? my mum wont allow another tank due to space problems so can i treat maybe one sick goldfish at a time? For goldfish that’s definitely not enough and will do more bad than good, unfortunately. What’s the situation here with your goldfish? What happened to them? If you don’t know what’s wrong there’s no use in treating them in a quarantine tank! I may be able to help you out if you give me some more information about the setup. How big is the tank? Did you cycle it? What are the water values? In the meantime, the fancy goldfish caresheet may be of help. yeah sure see i have around a 21 gallon tank and it has a bubble eye and 2 other goldies and a shark it has an in built filter which is kinda good as i think…. but since the past few days i have been noticing them sitting at the bottom…. i had done a cycle just a few days before … today i havnt fed them … i hope thats okay …. and am thinking bout giving them peas as i suspect my bubbly to hav constipation or swim bladder …..
plzz do reply soon … what do i do? I unfortunately see some big problems here. A 21 gallon tank is too small to keep goldfish in. You need at least a 40 gallon and that’s suitable for two fancy goldfish (they need 20 gallons per fish). You also need very strong filtration and that’s likely not present with the built in filter. You also can’t keep goldfish with any type of shark; they should only be kept with other goldfish! The problem with your goldfish is probably not caused by constipation or swim bladder issues but by ammonia. You unfortunately can’t just cycle the aquarium a few days: it has to be fully cycled, which takes about three weeks, during which you test the water a lot with a liquid test kit to see if the beneficial bacteria in your filter are working as they should. Now that the tank is probably not properly cycled, there are not enough beneficial bacteria to break down the ammonia the fish poop out and it makes them very sick. If your mom doesn’t allow you to get a bigger aquarium, you should rehome the goldfish to a fishkeeper that does have one or bring them back to the store. If she does allow it, you still need to rehome the shark unfortunately. Until you’ve found a new home for them or have set up (and cycled!) a larger aquarium, you should do daily large water changes with dechlorinated water of the same temperature. This should help bring the ammonia down and they should perk up a bit. If you haven’t read the caresheet I linked to in my last reply yet, I really recommend you do so! You can also show it to your mom to try to convince her. I’d also recommend reading this information about cycling an aquarium because you NEED to know how cycling works before you can set up any type of aquarium. Help!!! i fed my goldies peas but after that neither they are excreting but one goldy is sitting at the bottom and having a hard time breathing what do i do???? Hi, did you read my last reply? Feeding peas unfortunately isn’t going to help. You HAVE to change the water NOW with dechlorinated water and take the others steps I mentioned! Your goldfish likely have ammonia poisoning. Sorry about my late reply! Did you keep up the water changes throughout this week? How are the fish doing with the cleaner water? hey ! mari long time … sry had been sick for a while and unfortunately my bubble eye died 🙁 but i managed to save my other goldie :)…. i brought in 2 milky white koi ….. i was thinking about breeding them and would like ur advice so can i ???? i dnt know if i hav got male or female …. so if i send u the pics if u could help me ????? Sorry to hear about your bubble eye. 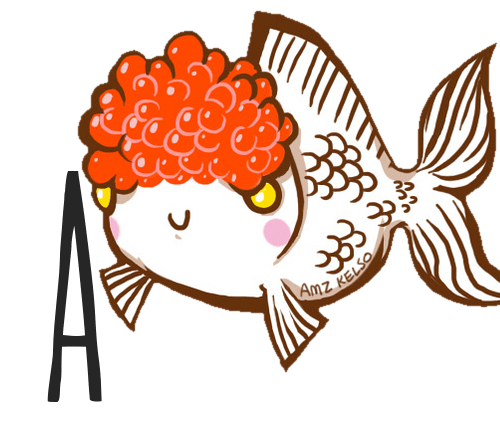 Honestly, I’m pretty shocked to hear you bought more fish, especially koi which are exclusively pond fish. I gave you good advice numerous times and you just go completely against it and make the situation a hundred times worse even though one of your fish has already passed away. Excuse my wording, but what were you thinking? So no, unfortunately you can’t breed your koi and you should return them to the aquarium store ASAP. Please research before you buy and follow the advise that’s given to you! Oh my god, this thread is insane. I wonder how Sukanaya’s fish keeping endeavors are faring these days. Two goldfish, 2 koi, and a shark…in 20 gallons. WTF? Hi there, its been such a long time since i checked my mail ! I see people are still commenting on my question so just to clear up , Mari thanx a lot for your advice but had to learn it the hard way !!! 🙁 I gave away my shark to a bigger tank and the koi to a pond . And also kim , XD i know i was quite stupid back then ……. Hope the Malawis do well for you – if they’re species that grow bigger be sure to eventually upgrade. Good luck! Surely 100% water changes are a bit drastic? You’d have to drip acclimate every time you did the change so as not to shock the fish. Tap water straight from the tap (or even aged for a day) will NOT be the same as the used tank water, and moving the fish into a container every day will cause it stress and increase the likelyhood of it getting a disease. Instead you can use an extra filter (or extra filter media) from an established tank and move it across to the QT tank when you add the fish. Make sure the filter has been running in the established tank for at least 2 weeks first. Use lots of fast growing stem or floating plants (either from an existing tank or bought at the same time as the new fish) in the QT tank. Floating plants are best as they use atmospheric CO2 and are closer to the light so generally grow the fastest. The dangling roots of the plants usually harbour lots of beneficial bacteria too (although they can also harbour parasites so if you bought them from the store you may wish to rinse the roots thoroughly in tap water before placing into the QT). You still need to do water changes (about 20 – 25% every 3 days or so) because the tank will probably undergo a mini cycle, and the plants may not remove 100% of the ammonia produced – but at least these smaller changes will not shock the fish. I personally always do 100% water changes every day, because after the first day there is not that much difference any more. A small fish doesn’t produce that much ammonia in a day, so the water quality etc. stays pretty much the same. I do agree that you shouldn’t put your fish in a container if it’s a species that’s easily stressed! It works fine with fish like goldfish and bettas, as long as you don’t go around chasing them with a net. I can usually scoop them straight out of the water and cover the temporary container so it’s not too stressful. They stay calm and seem to go into “night mode” as soon as the light disappears. I guess the amount of water changes you need to do also depends on the fish, if you put five neon tetras in a 5-10 gal tub the plant method is probably fine! Adding an extra cycled filter/filter media is not very effective in a quarantine tank in my opinion, unless you’re already 80% sure the fish is healthy. If you’ll end up using medication anyway the filter bacteria will just die off again, resulting in an ammonia spike. I do often use an uncycled filter that I clean out daily to remove poop and food bits. That way those things can’t sit there releasing ammonia. I do love the idea of floating stem plants and floating plants! They do indeed help keep the water clean and they’ll also provide the fish with shelter to avoid extra stress. Again, thank you for your comment! I’ll change some things in the article because you make a good point.